Premium financing makes it possible for high net worth individuals and businesses to purchase large amounts of life insurance without having to cough up large premiums upfront. Premium financing is simply a way of borrowing money to pay for these large premium expenses, and it can be used to attain large amounts of life insurance with only a minimal, upfront expense. Premium financing offers a variety of benefits, allowing individuals, such as the enabling the ability for individuals to fund existing premiums without liquidating assets, a reduced impact on their cash flow, and it can help them with general estate planning. With all the benefits premium financing offers, you want to make sure you work with the right premium financing provider to help you take the right path to invest in a bright future. 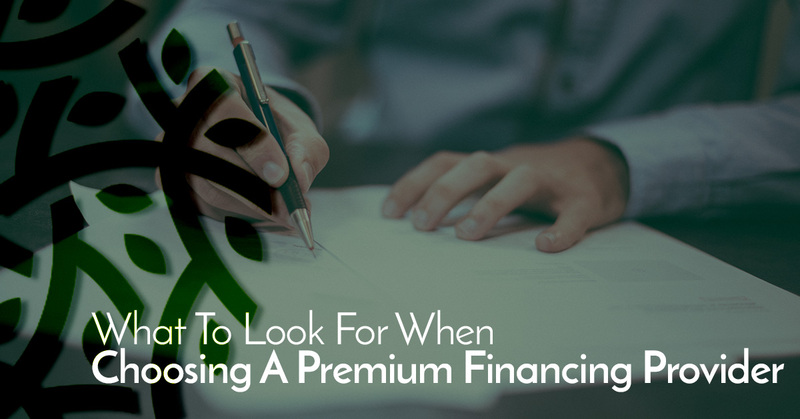 Luckily, in this article, we’ll share three things to look for when choosing a premium finance specialist. Whenever dealing with life insurance, you will always want to work with an experienced and qualified company to help meet your needs. This is especially important with premium financing — you want to find a team that can help you make wise and thoughtful decisions throughout this phase in your financial life, while helping you avoid any risks that may occur. At RBS, our premium finance company has well over 30 years of experience in the financial services industry and has successfully executed over 60 premium finance cases. We are always conscious of the risks that may occur with premium financing strategies, but we make sure that you are aware and feel secure every step of the way. When financing your life insurance premiums, you want to be able to choose which financing product is right for you. You’ll want to look for a company that offers a variety of different options and will help you choose the one that is best for your needs and that will safeguard your family’s wealth. Additionally, look for providers that include flexible premium financing products too — while some premium financing providers set strict limitations on clients to mitigate default risk, offering flexible product options can go a long way. At RBS Life, we offer a variety of premium financing products, including flexible products. To learn more about each of our products, contact our helpful premium financing products. Your financial situation is unique, so you want to look for a premium finance provider that will take the time to assess your needs, goals, and risk tolerance to attain the results you are trying to achieve. Additionally, you’ll want to find a provider that will be there with you every step of the way, making sure you have a clear understanding of what is going on, how your financial goals are being pursued, and what your financial future will look like. At RBS Life, we are committed to the success of our clients. We guide them through the entire premium financing process: from implementing the initial strategy, writing the policy, helping secure the loan, having an estate attorney review the trust through the ongoing maintenance and monitoring of the plan in order to make sure that the strategy succeeds and our client’s full satisfaction is achieved. Are you in need of insurance premium financing solutions? Contact the team at RBS Life, a leading premium finance company servicing Orlando, Tampa, and the surrounding areas in Central Florida.